Plymouth Argyle have now won their last three meetings with Exeter. 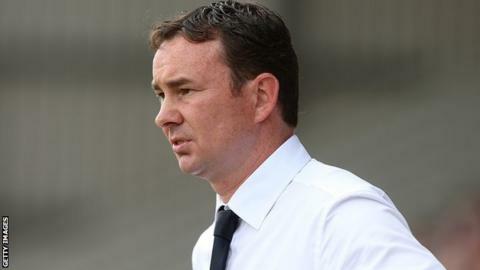 Plymouth Argyle manager Derek Adams says their 2-0 Football League Trophy victory over Devon rivals Exeter City on Tuesday was "exhilarating". Goals from on-loan pair Hiram Boateng and Craig Tanner secured the win at Home Park in the club's 5,000th match. "Exhilarating's probably the word - it was a fantastic performance," Adams told BBC Radio Devon. "There's a heartbeat in the football club, there's a great soul, and we're bouncing along just now." The League Two leaders have won their last three games and have lost just one of their previous 11 overall. The derby clash attracted a crowd of 9,441, the biggest of the competition so far this season. "This game was by far the best. We need to keep it going but we've got a city that's with us," added Adams. "We've totally dominated a football match and to do that in a derby match is very difficult. "We passed the ball with an outstanding capability and we've got a very good team now."